2 by 3 Heroes: SECOND! 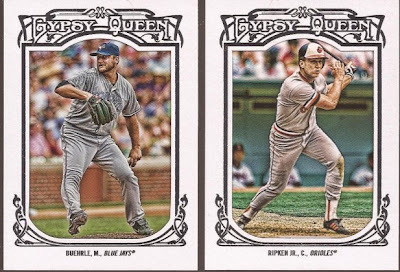 From JBAnama's blogroll, it appears I was not the first, but the second to find some 2013 Gypsy Queen in my local Walmart. I fired up my really crappy flip camera and live ripped what I bought. Ok - if you sat through that, a hearty "thank you" and "I'm sorry" is both said with earnest. Since the color quality has a lot to be desired, here is a few scans to enjoy. There's your base. I like the border color WAY MORE than last year. You can see that Gehrig card so much more in the scan. That, folks, is one beautiful uniform. Even if it is evil empire. Here are your rack pack framed parallels. I guess they are ivory in color. Looking now at the Buehrle, that is a photoshop from a game at Wrigley. Some Abbott for Nick at Dime Boxes. Interesting his base is Angels and his insert is Yankees. More inserts. Not sure how I feel about the Dealing Aces set. I get the playing card idea, but...I don't know. Maybe it's too busy. 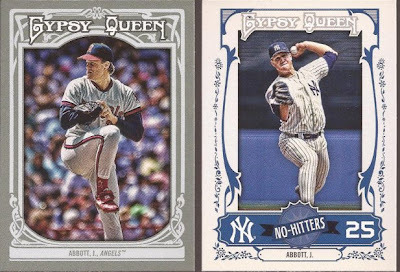 I think the No Hitters is a very nice insert set as the borders really compliment the team colors. Glove Stories looks a lot like last year, so no scan. Sliding Stars has a new gray border. And those collision cards are sweet. SOOOO much nicer in black and white. 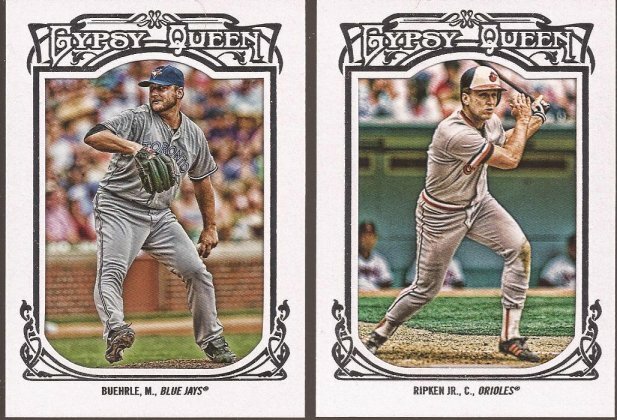 Hey Topps - more like that please! Alright - I'll work on the lighting for my next video. Maybe I can find some 2nd tier movie actress to rip packs for me. Or some has-been singer. I got options. ..but I'm sure you had a good reason for it.